« G.Hack, Campus Party Europe 2013 Community Partner ! 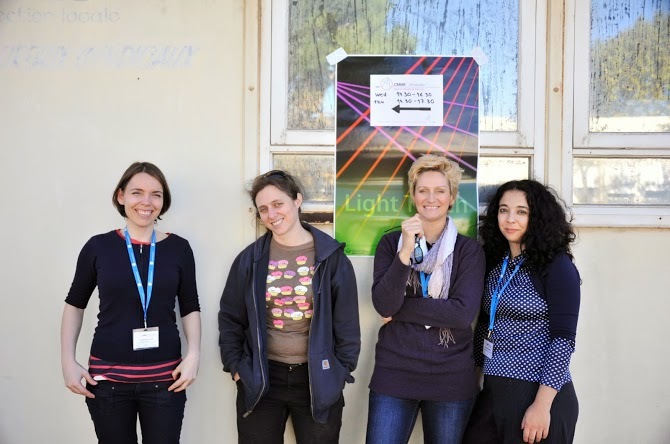 A few weeks ago G.Hack team Katja Knecht (MAT), Laurel Pardue (C4DM), Patrizia Carlota (Drama) and Nela Brown (CogSci) flew over to Marseille for the CMMR2013 conference to exhibit our interactive installation Light Touch. We secured the funding for ALL FOUR authors of the installation to travel to Marseille, attend the conference talks and concerts and network with the conference attendees ! A BIG THANK YOU goes out to the following QMUL / EECS people who helped make it all happen: Mike Watkinson, Lucie Dubinik, Andrew McPherson, Mark Sandler, Richard Kelly, Geetha Bommireddy, Chris Harte, Henrik Ekeus, Fiore Martin, Ben Bengler, Bogdan Vera, Holger Kirchhoff, Sharon Cording and Laura King. A SUPER SPECIAL HOLA goes out to the amazing G.Hack troops: Katja, Laurel and Patrizia who made this conference ‘road trip’ absolutely unforgettable ! This entry was posted on Wednesday, November 6th, 2013 at 19:43	and is filed under Light Touch. You can follow any responses to this entry through the RSS 2.0 feed. You can leave a response, or trackback from your own site. G.Hack is a collective of female researchers within the School of Electronic Engineering and Computer Science at Queen Mary, University of London. The group is focused on sharing knowledge and developing interactive media projects.